Just a mile east down the line from our house is the Vintage Parkway overpass, referred to officially on the BNSF as Oakley. 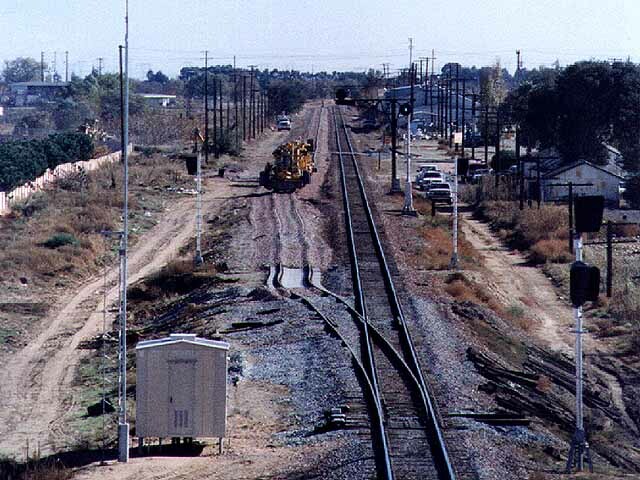 This is the point at which the tracks change from a single mainline to a double main, or vice-versa depending on the direction a train is traveling. Until February 1999, this was also the eastern boundary of track warrant control (TWC) on this portion of the Stockton Subdivision, which meant that all westbound traffic had to receive verbal clearance from the dispatcher before it could proceed. This was particularly useful if you happened to own a radio scanner. Things have changed, however. Now trains are allowed to proceed between Oakley and Pittsburg on signal indication, and only receive a track warrant if they are continuing west beyond Pittsburg. Fortunately, you can still "hear" approaching westbound trains when they cross the talking defect detector at MP 1144.5. Westbound trains frequently wait "in the hole" at Milepost 1146.0 (just east of the switch) for approaching eastbound trains or superior trains such as Amtrak. This situation provides an excellent opportunity for railfans looking to get roster shots of their favorite motive power, as well as action shots, meets and more. 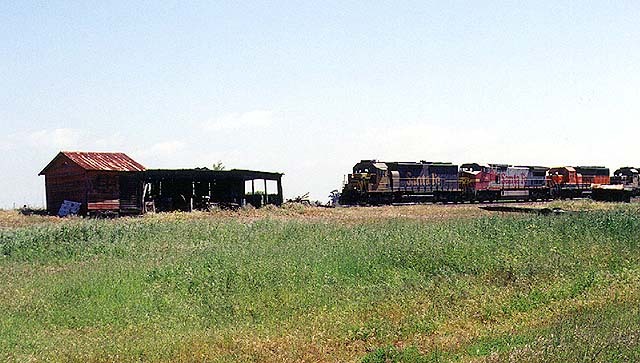 In 1996 the Burlington Northern Santa Fe converted a 7-mile stretch of single track mainline to a double track main between Bixler and Oakley. This photo was taken during the final days of construction from atop the Vintage Parkway overpass, looking east. That is the track-layer in the center. The old searchlight signals and signal bridge are also visible. They were removed when the new switch went into operation. The line poles in the righthand portion of the photo were removed in August 1998. Ah, progress... Photo by Glenn Gehlke. 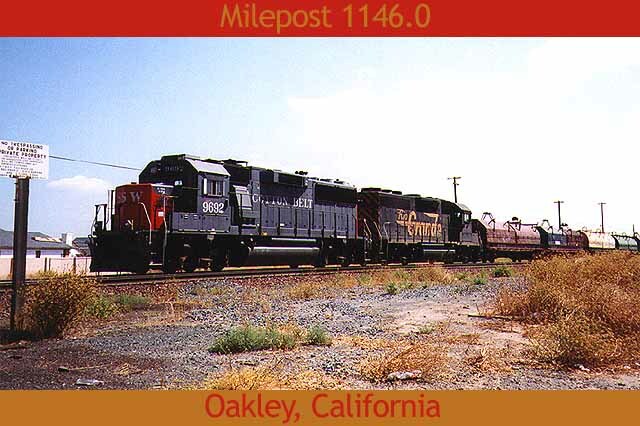 On Oct. 12, 1998, BNSF 1075 waits on the north main as Amtrak 2051 powers Train 714, the eastbound San Joaquin, through this meet at Milepost 1146.0. Photo by Roni Gehlke. Clouds of diesel exhaust rise skyward as the colorful BNSF consist revs out of the hole to continue on its journey west. Photo by Glenn Gehlke. 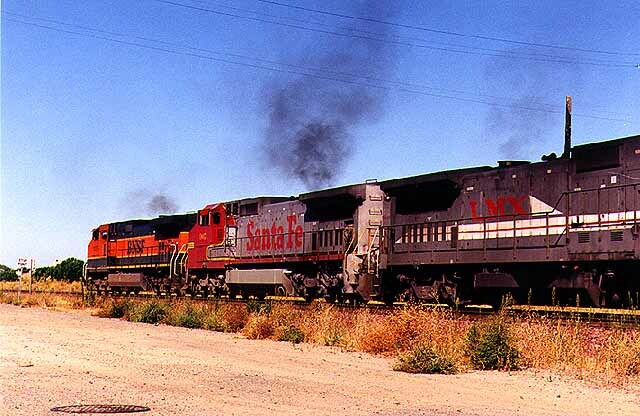 The Santa Fe 808 not only wears its original warbonnet paint but also its original owner's name, an increasingly rare sight. 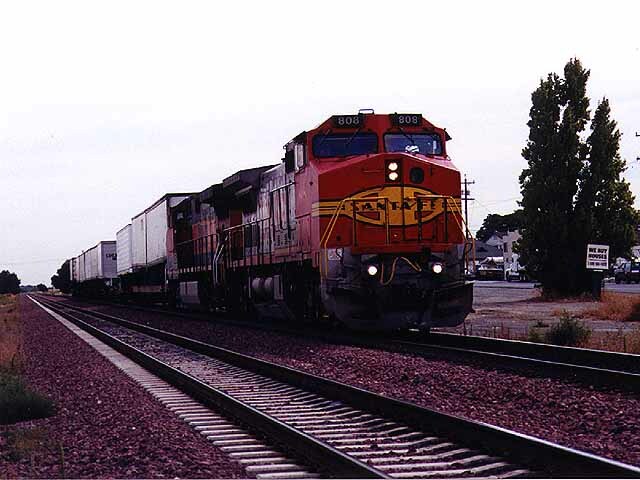 On Oct. 12, 1998, this short BNSF freight sits on the south main while awaiting a signal. Here you get a clear look at the concrete ties used to construct the north main. The south track still has its original wooden ties. Photo by Roni Gehlke. Perhaps one of the last cabooses still in use on a regular basis, UP 25833 brings up the rear of the daily Steel Train bound west for Pittsburg in late March 1998. Here the train is blocking the private crossing for the Oakley Sanitary District. The crossing is seldom used, however. A few years ago it was the site of a horrible accident between a farm tractor and a Santa Fe freight train. Trains can really sneak up on you here, and without gates such occurrences are almost guaranteed to happen again. Photo by Roni Gehlke. The Steel Train never fails to offer surprises for railfans, with its odd array of aging locomotives. 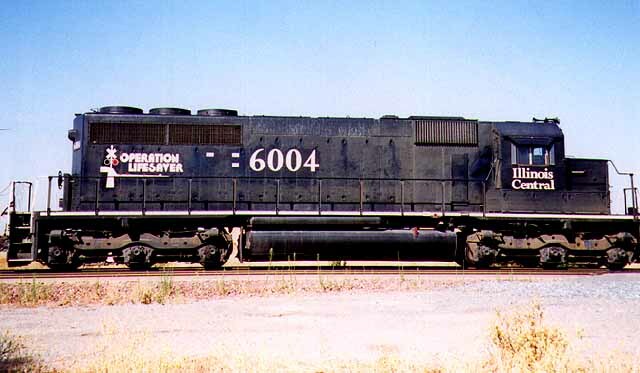 The struggle for identity between the Union Pacific and its predecessor in these parts, the Southern Pacific, has been played out on the nose herald of SP 7676. This time the UP boosters won out with a can of spray paint. This shot, looking east from the private crossing at Milepost 1146.0, was taken Oct. 12, 1998. Photo by Roni Gehlke. 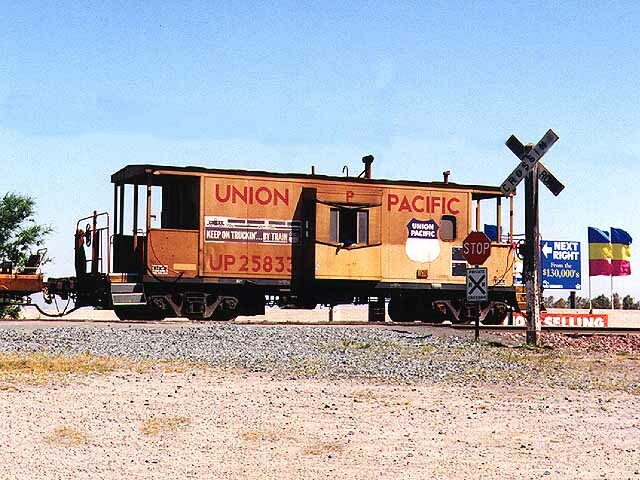 Who says Southern Pacific is the only railroad that never washes its locomotives? This Burlington Northern unit has certainly seen its fair share of grime during its travels. This shot was taken the morning of Oct. 12, 1998, as the train waited for the signal after an earlier westbound had passed this point only minutes earlier. Photo by Roni Gehlke. Foreign power is not uncommon along the Stockton Subdivision. 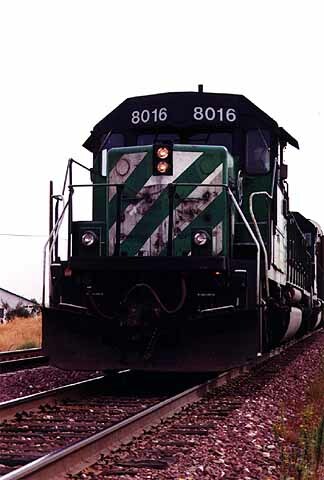 In September 1998, the Illinois Central Operation Lifesaver unit 6004 turns up amid a westbound BNSF consist waiting on the south main track. We have also spotted Norfolk Southern, Conrail, CP Rail, Montana Rail Link and Kansas City Southern units, along with a large variety of leasers. Photo by Roni Gehlke. 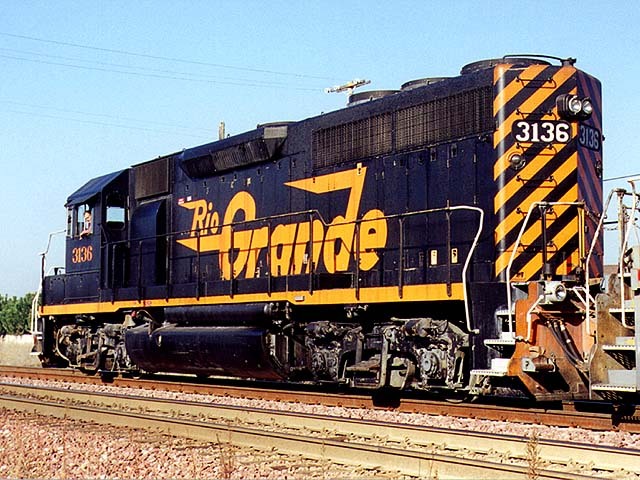 Speaking of foreign power, here is Rio Grande unit 3136, a GP40, looking unusually clean as it sits on the north main track with the UP Steel Train in tow during December 1998. Photo by Roni Gehlke. 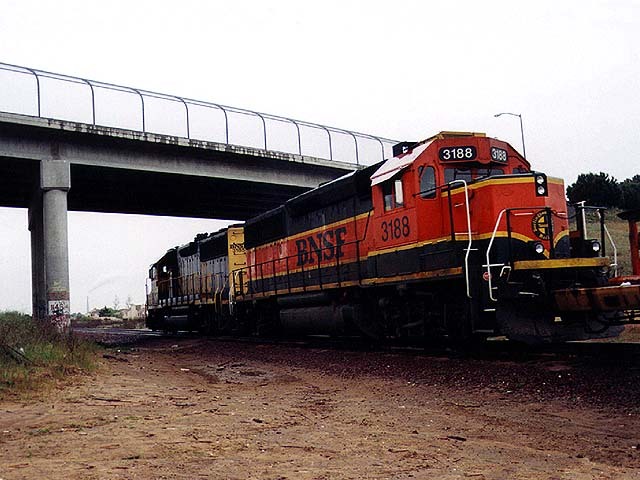 SSW 9692 and an unidentified Rio Grande unit idle on the north main in September 1998. Mergers are a funny thing. 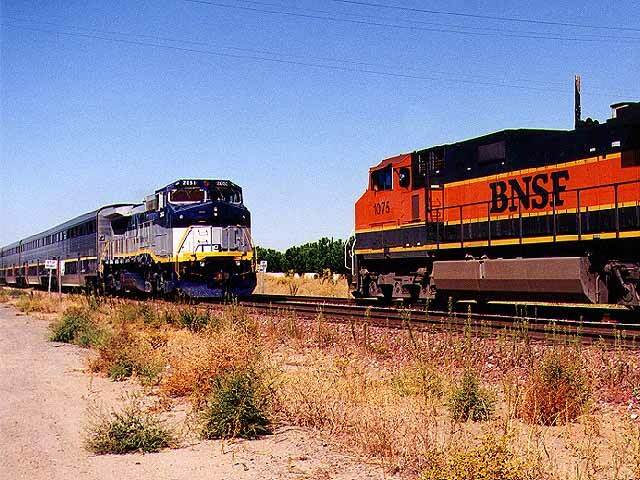 Here we have the locomotives of two defunct railroads heading up the Union Pacific Steel Train on tracks that once belonged to the Santa Fe and are now owned by the BNSF. So, whose train is it really? Photo by Roni Gehlke. A ramshackle shed sits near the mainline at Milepost 1145.5 . 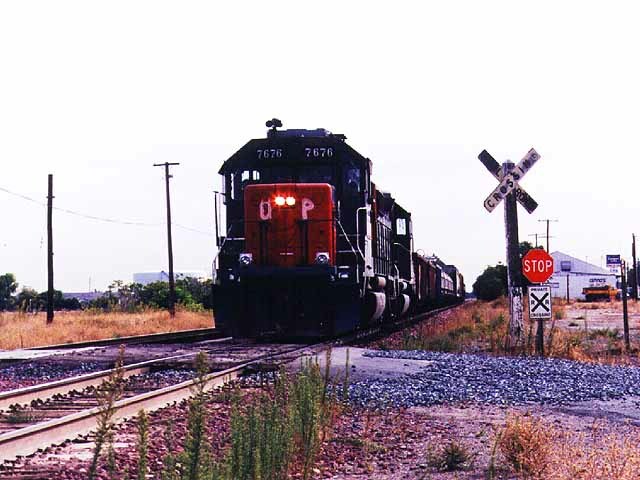 In early April 1999, a westbound manifest freight prepares to pass the aging structure, which is still in use by the property owner. We photographed it from the shoulder of nearby Highway 4. Photo by Roni Gehlke. This page was last updated Sunday, June 20, 1999 at 00:40hrs.